Hello and welcome to the Unofficial FC Kochi page. The Unofficial FC Kochi Page would like to wish all FC Kochi and Indian Football fans a happy new year. The Romario and Ronaldo of Indian Football. Certainly there is light at the end of the tunnel for Indian Football. Raman Vijayan and I.M. Vijayan. Two of the best players Indian football has to offer. A warm good bye to these players from FC Kochi and thanks for the best moments they provided the team with. Ongoing/Upcoming Tournament: Coca Cola National League- January 1rst week Next match- Salgaocar vs. FC Kochi Results: -Click for Rovers Cup Scores- -Click for Durand Cup Scores- --Current News-- February 3, 1999- Indian Bank 0-3 FC Kochi- Indian Bank's chances of qualifying for the Super Leauge suffered a severe jolt when they went down 0-3 to FC Kochi in their last home match here this evening. February 1, 1999- FC Kochi 1-3 East Bengal- East Bengal kept their reputation intact to thrash FC Kochi 3-1 in their away encounter and garnered full three points in the NFL Championships match at the LBS here tonight. 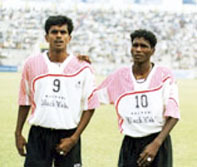 January 27, 1999- FC Kochi 3-1 ITI- FC Kochi collected three points as they beat ITI in Bangalore. There was no stopping the Kochi attackers. Since this page is dedicated to FC Kochi, updates can only be made whenever there is any news related to FC Kochi. Find out more about the page by surfing the "Info" page. Kindly sign the guestbook in our "Be Heard" section. Kindly read the disclaimer before reading the articles acquired from the newspapers. Disclaimer: This site is not affiliated with FC Kochi in any way. All copyrighted material is the property of its respective owners. All trademarks aknowledged. Content of the website is copyright 1999 Simon Jacob.